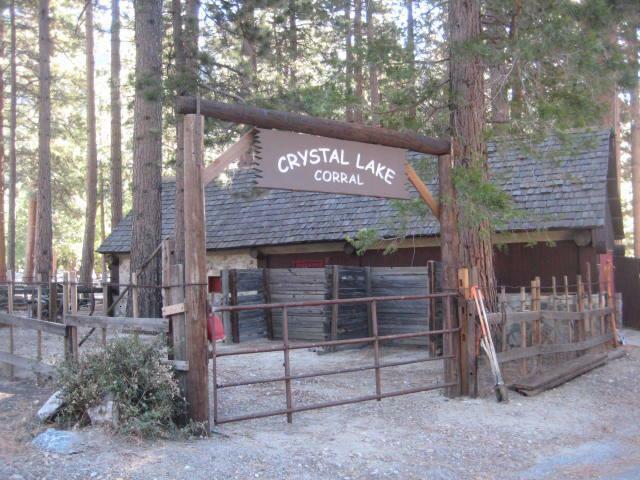 Crystal Lake has three cabins owned and maintained by Adam who can be reached at 1-626-910-1029 to talk about what is available for renting, what the fees are, and to answer any other questions people might have about staying at night in comfort. Three cabins have a single bedroom. 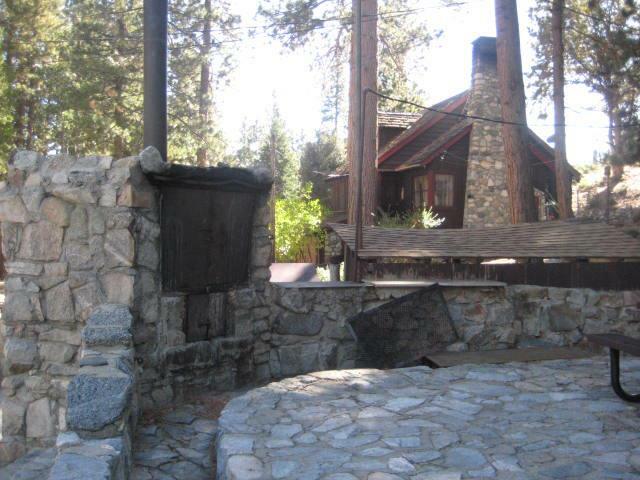 There are metal fire rings and concrete tables within the area of the cabins and three of the cabins has running water, electricity, and propane gasoline. 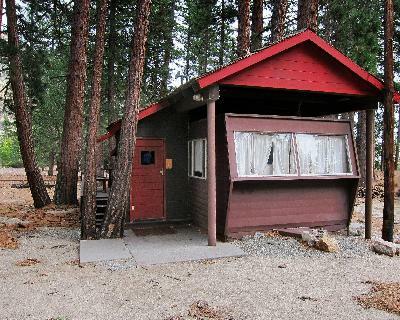 Cabins during the Summer are a good way to exercise, hike, bike, backpack, climb, and fish withing the Crystal Lake Recreation Area and then have a comfortable place to retire to for the evening. In the Winter and rainy season they provide a solid shelter to stay warm in during the day as well as night. There is also a fenced-in area for horses, mules, and llamas that you may use, and of course there is the public area which has large metal tables on the rock-and-concrete patio at the cafe which may be used for meals, meeting-up with friends, and talking with other visitors to the forest. 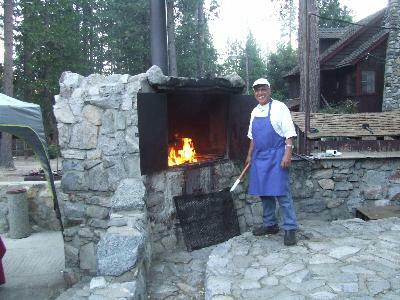 Adam also has a series of stoves and a large fire place at the cafe patio and because he's been a world-class chef before coming to the mountain, his cafe meals as well as his one-of-a-kind BBQs has become a minor legend among Southern California hikers, bikers, campers, and fishers. The information provided here describes what is available, and within the text that is offered you may find links to click on to see more detailed photographs of the outside as well as the inside of the cabins. 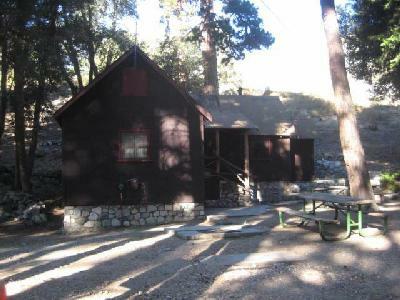 Cabin #1 is one room, one of which is a kitchen with a working propane stove and a seporate bedroom with a door which may be closed. The sink has running water, there is a heater for cold Winter nights, and there are table lamps. A fold-out couch also provides a second bed. There is also a small bathroom with sink and a shower. Electrical outlets. Wall-to-wall carpeting which some people like to lay their sleeping bags on to. Outside if a very nice metal fire ring and a BBQ up on a metal stand. 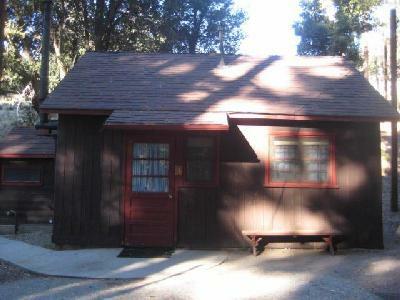 Cabin #2 is a one room cabin. There is a kitchen with a working stove, running water, couches, lamps and ceiling lighting, tables, a bedroom, propane heating, electricity, and wall-to-wall carpets. There is a small bathroom. Cabin #3 is a long trailer which has a kitchen (with propane stove and sink with running water) a living room with couches and tables, a bathroom with a flushing toilet and tub/shower, and a bedroom with a large bed. The back door opens up on to a wood patio. A number of overhead and table lamps provide excellent lighting for reading, and the couches offer a great way to lay back, relax, and read at night. There are many electrical outlets provided. Wall-to-wall carpeting. If you have horses or other stock animals you might like to bring up with you, the old Crystal Lake Corral has been rebuilt and restored to the point where there is now an exercise area behind horse-resistant fencing. Though Adam does not keep feed and water tanks at the corral, you could bring what you need and fill your water tanks from the water that is available at the campgrounds. The corral gate is usually not locked, and it is inside a second fenced-in area which helps to keep children and the camping public from climbing in among your animals. If you wish to secure your animals, you would need to bring a chain and your own lock. For a larger photograph click HERE then use your browser's back-arrow to return to this page. At the large rock-and-concrete patio next to the cafe there is a very large fire place suitable for cooking and staying warm. There are also a number of propane BBQs at the patio and a sink with running water. A number of metal tables at the patio makes holding meetings, lunches, dinners, and even weddings rather memorial. Adam was at one time a world-class chef who has brought his experience as well as his special dishes to the cafe to the point where his chili beans and the tuna sandwich have become well known among local forest visitors. If you wish to have Adam cook for you or a group that you bring up, let him know what you're looking for and he will get it done! For a larger photograph click HERE and also click HERE then use your browser's back-arrow to return to this page. 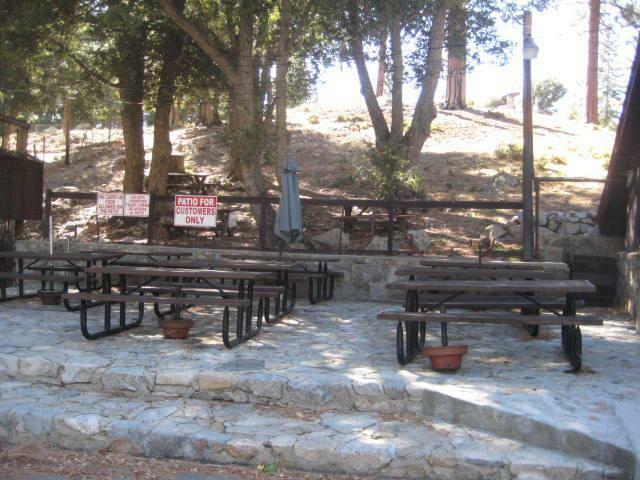 The tables at the cafe are one of the most appreciated areas of the Crystal Lake Campgrounds where hikers, bikers, campers, and fishers often relax and talk with and get to know strangers who share the same love of the forest and for exercise as they do. The tables will have shade umbrellas some parts of the year, and there is an outside faucet with cold water that can be used for drinking, cooking, washing-up in, and whatever else you might need. Often on the hillside overlooking the patio one can see deer either standing and watching the people below, or slowly and quietly working their way across the hillside.